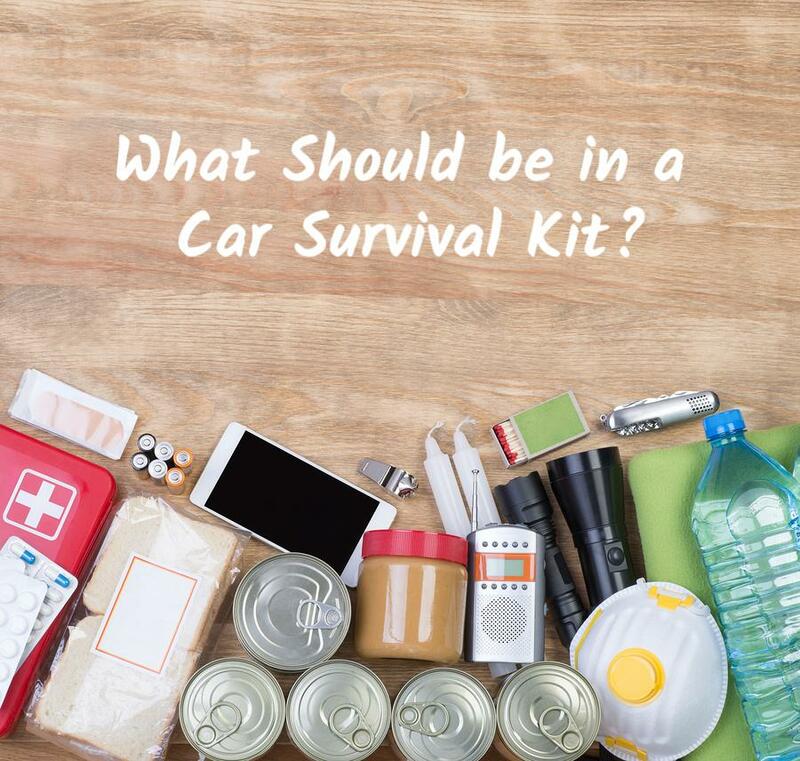 What Should be in a Car Survival Kit? An emergency can arise anytime you are on the road. You could be in an accident, stranded on an isolated stretch because of a roadblock from a fallen tree, or stuck because of a flat tire. For this reason, it is always important for every car owner to keep a roadside emergency kit in their vehicle, so you are prepared for any eventuality. Although the roadside emergency kit is a critical necessity, several car owners don’t give much thought to keeping even a basic emergency kit in their cars. If you are in an emergency, your roadside survival kit could literally be the difference between life and death. Is a Basic Emergency Kit Enough? A simple readymade roadside emergency kit is better than not having anything on hand. However, the smarter thing to do would be to supplement your basic emergency kit and customize it to your needs. So, for example, if you have a medical condition or a family member has a certain medical requirement, you would want to carry medication or a piece of health equipment such as an inhaler. Making sure your emergency kit includes that specific item is important, especially in an emergency. You also need to consider the climatic conditions in your location and the roads you drive on when putting together your roadside emergency kit. To help you get started, here is our list of absolute essentials that should go into a roadside emergency kit. You can always expand your kit based on individual needs. First aid kit – in addition to regular items, don’t forget to include prescribed medication for you or your family members. Tools and items for flat tires – a spare tire, a patch kit, a lug wrench, a jack, and compressed air. Food items like granola or energy bars that are nonperishable. List of emergency contacts (family, medical professionals, friends) in case of an accident. LED flares, regular flares, or reflectors. Jumper cables or portable, lithium-ion battery with jumper cables. Tool kit – pocket knife, screwdrivers, an adjustable wrench, pliers. Hand-crank weather radio with cell phone charging. Spray bottle with washer fluid. Once you are done collecting all the items you require for your roadside emergency kit, it is time to store them in your car. Stock the survival or emergency items and the tools and equipment separately. You can use normal cardboard boxes or place them in a backpack or any other kind of container unit that suits you. Make sure you clearly mark both containers/bags and store them in a location that is easily accessible both for you and family members during an emergency. Now that your roadside emergency kit is ready, it is time to familiarize yourself with the items in the kit. You should know what to use and how to use the tools and equipment should you face a challenging situation. Especially if roadside assistance is not available. There are two basic things that ideally every driver should know: first, is how to change a tire and second, how to jumpstart your car. These are two of the most common situations you might face on the road. Although roadside assistance is a boon in today’s times, you never know what situation you could face. Which is why it is a good idea to consult with a professional car technician for some advice on basic car trouble issues and emergency action if you face some of these issues. 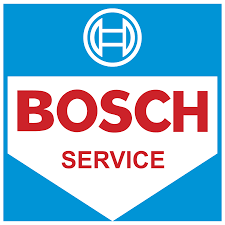 Last but certainly not the least – make sure you take your car for regular servicing. This action could save you a lot of car trouble and help keep your car in good condition. Reliable Car Maintenance with Professional Auto Experts! If you are looking for professional and credible car repair service for your car, give Virginia Auto Service a call today at 602-266-0200 or schedule a visit with us online. Arizona is a large state with a lot of natural, untouched land in and between its cities. As such, there will likely come a time when Arizona drivers find themselves on the road with nothing but nature surrounding them. While this presents us with some of the most scenic drives in the country, it can also present a problem. 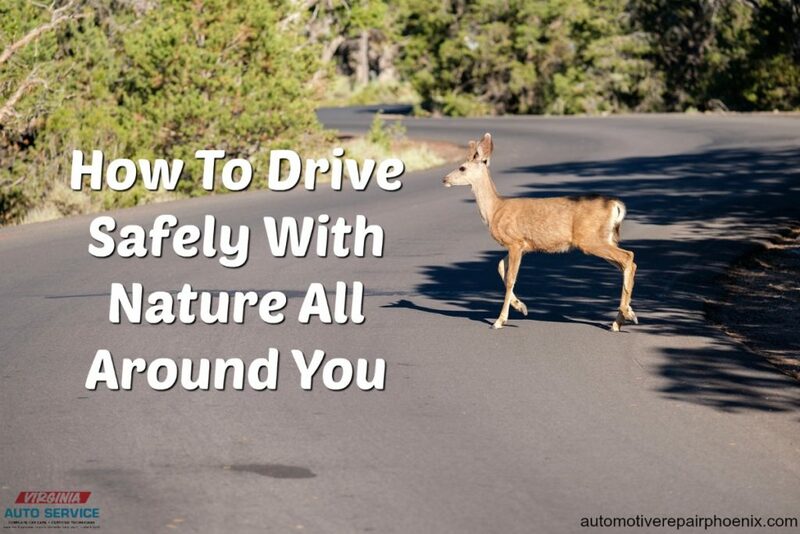 When you are surrounded by nothing but nature, the likelihood of encountering a deer or other animal crossing the road increases. 1. Remain alert. In other words, pay attention. Seems simple enough, yet you’d be surprised how often drivers fail to do just that. Stay off your phone and avoid other distractions. Don’t let a seemingly empty highway fool you into a false sense of security. Animals can make their way onto the road in front of your vehicle at any instant. In places where tree and grasses are thicker, they may seem to appear out of thin air with no warning. 2. Make sure you can see well at night. Most animals seem to be more active at dawn, dusk, and in the nighttime- when visibility is the most compromised for motorists. Make sure your vehicle’s windshield has no cracks that obstruct your view and that it is clean. Use your high beams to help watch for the glow of animal eyes and movement. Learn more about safe night driving practices in our blog post 15 Tips for Driving Safely at Night. 3. Take it slow. After dark, don’t drive over 70 miles per hour. When you do, you are out driving your headlights, which leaves you no reaction time if there is an obstacle in the road. In both the day and night, consider driving no faster than (or maybe slightly under) the posted speed limits, especially in areas where signs warning of animal crossing activity are posted. Slowing down may cause you to reach your destinations a little later, but that is far less inconvenient than the aftermath of a high-speed crash with an animal. 4. When the inevitable occurs. Regardless of how well prepared you are, there may come a time when you simply cannot avoid hitting the animal. If you find yourself in this situation, remain in your lane and, with a firm grip on your steering wheel, push down firmly on your brake pedal. Thankfully, most modern vehicles come with anti-lock brakes which will help you to stop quickly and help you maintain steering control. If you have the time, lay on your horn. Many animals find themselves in a headlight induced trance (you’ve heard the term “a deer in headlights”). Blasting your horn may break the trance in enough time to allow the animal to run out of harm’s way. Do not swerve to avoid the animal. Doing so could result in a more dangerous collision with another vehicle, a rock wall, or even a ditch or cliff of some sort- and could cause you to lose control of your vehicle. No one wants to hit an animal, but your safety and the safety of your passengers and other motorists must come first. 5. After the collision. For smaller animals like skunk, rabbits, or possibly fox or coyote, your vehicle will likely be fine with no problems other than shaken nerves. However, striking large animals like deer and elk may cause some severe vehicle damage and possible injury to occupants of the vehicle. If you collide with an animal and it is injured but not dead, it can become dangerous. Stay in your vehicle away from the animal and call the authorities for assistance. They will help take care of the animal in the safest and most humane way possible, as well as help you with any needs you may have. They will also file an incident report that you will need for insurance purposes. A little preparedness and caution will help you get where you are going safely while protecting the lives of the creatures who call the Arizona wilderness home. For your automotive repair and maintenance needs, call on the experts at Virginia Auto Service. We have been Phoenix, Arizona’s go to shop for quality, reliable automotive care for over 20 years. Call us at 602-266-0200 or schedule your next appointment online. 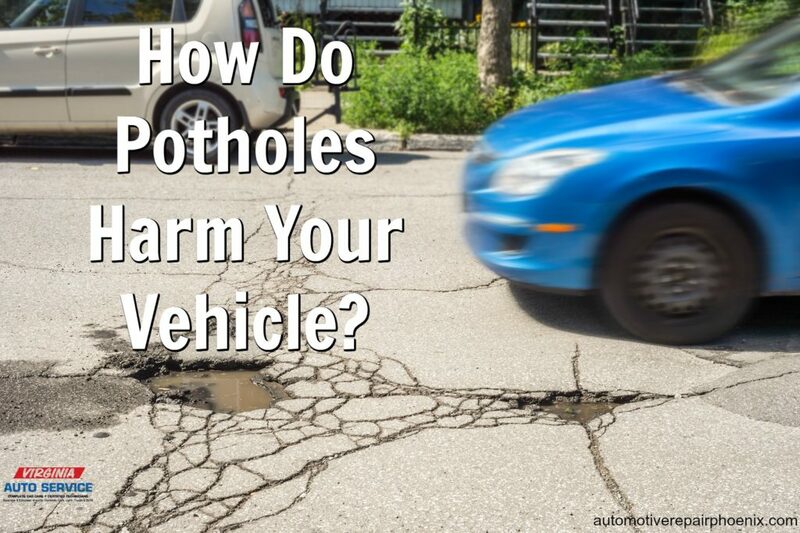 How Do Potholes Harm Your Vehicle? Potholes are pesky little road hazards that can result in anything from a simple jolt to a blown tire. The pothole is the sworn enemy of your tires, and unfortunately, they won’t be going away anytime soon. If you’ve driven a vehicle, chances are you’ve encountered one at one point or another. Most of the time, once you see the pothole, it is too late to avoid it. Potholes are holes of various shapes and sizes that appear in the roadway. Potholes are formed by the expansion and contraction of ground water under the pavement. If the groundwater has a chance to swell or freeze, it will expand taking up more room under the pavement. As such, the pavement will expand and possibly crack, weakening it. Then once the water recedes, the pavement will contract, and gaps/voids will be made on the surface underneath the pavement. Each time this happens the pavement becomes weaker. As the heavy weight of vehicles passes over these weak spots in the road they break down and the pavement becomes displaced creating a pothole. Pay attention. The best way to protect your vehicle from pothole damage is simply to pay attention to the road before you. If you can spot them early enough you have a better chance of avoiding them. Try and avoid hitting them by swerving around them if its safe to do so. This way you can avoid all potential damage. You should leave enough space between you and the vehicles in front of you on the road so that you are better able to see the road ahead and give yourself more time to avoid them. Be aware of water-filled potholes. It is especially important to watch for potholes that are filled with water. Water-filled potholes can be exceptionally dangerous because you have no way of knowing their depth. If you are driving on a road that is worn and damaged, you need to drive slower to minimize the damage to your vehicle when you hit a pothole. Don’t slam on the brakes. At some point, no matter how careful you are, you will likely hit a pothole. When you do, it is important that you don’t slam on your brakes. When you hit the brakes your vehicle tilts forward putting more stress on the front suspension- the first part of the vehicle that hits the pothole. Slamming on your brakes will cause more damage to the vehicle because of the extra force. Inspect your vehicle if you experience a considerable jolt. If you hit a pothole that is particularly jarring, you shouldn’t hesitate to immediately check for a flat tire. If your vehicle is still drivable, by all means, get on your way. However, you should pay close attention to your vehicle as all problems don’t present themselves right away. At some point, you should recheck your tires for bulges, uneven wear and other sorts of visible damage. These are usually the first signs of damage caused by a pothole. You should also pay attention to any new vibrations or the car pulling strongly in either direction. This is a sign that the pothole threw your vehicle out of alignment or damaged your steering system. If you continue to drive with such problems they could wind up causing further damage and become even more expensive to repair, so have your vehicle taken care of as soon as you notice any sign of trouble. If you have hit a pothole you can bring your vehicle to Virginia Auto Service and we will assess the damage and get it back on the road in no time. Call us at 602-266-0200 or schedule your next appointment online. 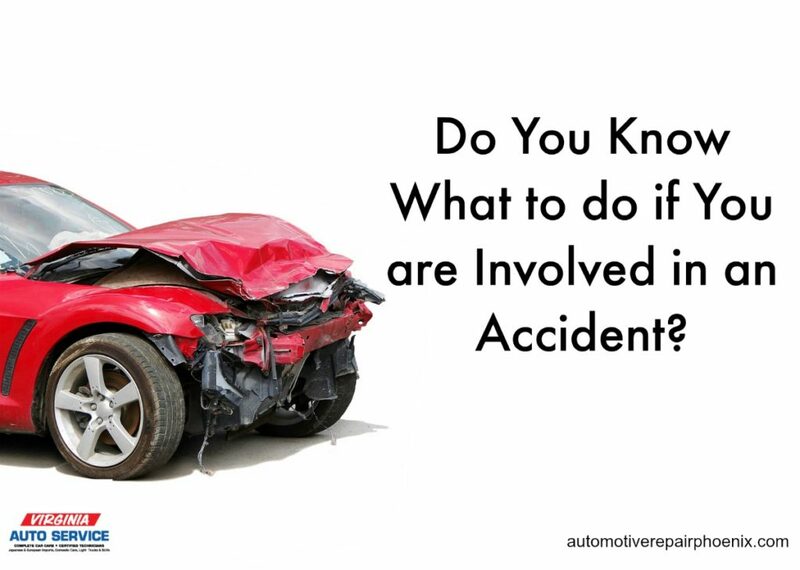 Do You Know What to do if You are Involved in an Accident? The National Highway Traffic Safety Administration (NHTSA) states that, in any part of the world, there is a motor vehicle accident every 60 seconds. Which pretty much means there are nearly five and a quarter million vehicle accidents each year. When you go by these statistics, it is highly likely that there will be a time when you are involved in an accident. When it is your first auto accident, you may be unsure of just exactly what it is you are supposed to do. The weeks, and sometimes months, following an auto accident may be very stressful. The following advice will hopefully ease some of the pressure. The first thing you need to try and do is remain calm. It is easier said than done but take a deep breath or two then proceed with the steps below. If neither you nor your passengers are seriously injured, and you are able to do so, you should move your vehicle out of the middle of the road. Try to move as far to the side of the road as you possibly can. If you are unable to move your vehicle make sure your hazard lights are on so that other motorists will know that your vehicle will not be moving. Remember, it is illegal to leave the scene of an accident, so don’t leave. Put your vehicle in park and shut it off. Glance at your surroundings and make sure that it is safe to get out of your vehicle. If the road is clear, get out of the vehicle. Set out flares or safety cones if you have them. If anyone involved in the accident appears to be injured call 911 right away. Often, pain and injuries do not become evident to a person involved in an accident for hours or even days after an accident once the adrenaline has worn off. So, even mild injuries and symptoms should be looked over by a healthcare professional. Even in a minor accident, it is a good idea to have a police report for your records. These reports are helpful when dealing with insurance companies and other motorists. Fully cooperate with the officers but watch your language around them and avoid taking blame or blaming others. If they ask you if you are injured say that you are “not sure” rather than no. Let the officers determine the events of the crash objectively based on the evidence in front of them. Photos are very useful in the insurance claim process. If you have a camera or phone with picture taking abilities don’t hesitate to take photos at the scene. Take pictures of any visible injuries to yourself and/or your passengers, the damage to your vehicle, the accident location, and other people involved in the accident. Be sure to stay out of the way of any police investigation while you take your photographs. Often, injuries from an accident are not immediately evident. Many people won’t notice pain for a few days. Unless you are 100 percent positive you weren’t injured you should get medical attention either by your family doctor or at an urgent care. Call your insurance company and start the claims process. Make sure you have all the information you gathered on hand. Sometimes dealing with the process of an accident on your own isn’t so bad, others you may want to get help from a lawyer who specializes in this sort of thing. An attorney can protect your rights throughout the process and can help guarantee that no evidence with any value is destroyed. Insurance companies will often want to take a statement immediately after an accident, however, an attorney would advise you to wait until you have received legal advice. Having an attorney help you through the accident aftermath will help to make sure you are paid in full for any damages or injuries you sustained. We hope you find the above advice helpful should you find yourself needing it. However, we hope even more, that you never do! You can’t control everything that happens on the road around you, but there is one thing that you can control to help keep you and other motorists safe on the road and that is performing regular auto maintenance. Having regular maintenance performed on your vehicle prevents drivability issues, reducing the chances of an accident related to a vehicle malfunction. To keep your vehicle running optimally, bring your vehicle into the experts at Virginia Auto Service. Call us at 602-266-0200 or schedule your next appointment online. If there is one thing every driver should learn to do, it’s how to change a flat tire. Today, with technology like cell phones, getting help in an emergency is a lot easier than it used to be, but knowing how to help yourself is still important. There is always a possibility that your phone may be dead or that you are beyond the range of service. So, even if you have roadside assistance, there may come a time when you simply must know how to change a tire yourself. The good news is changing a flat tire really is not that challenging when you are properly prepared. Every driver should keep a roadside emergency kit in their vehicle at all times. Among other items, the tools you’ll need for a tire change should be included. We always stress the importance of checking your spare tire’s inflation along with your others, and when it comes time to use it you will understand why. The last thing you want when you have a flat tire is to also have a flat spare! 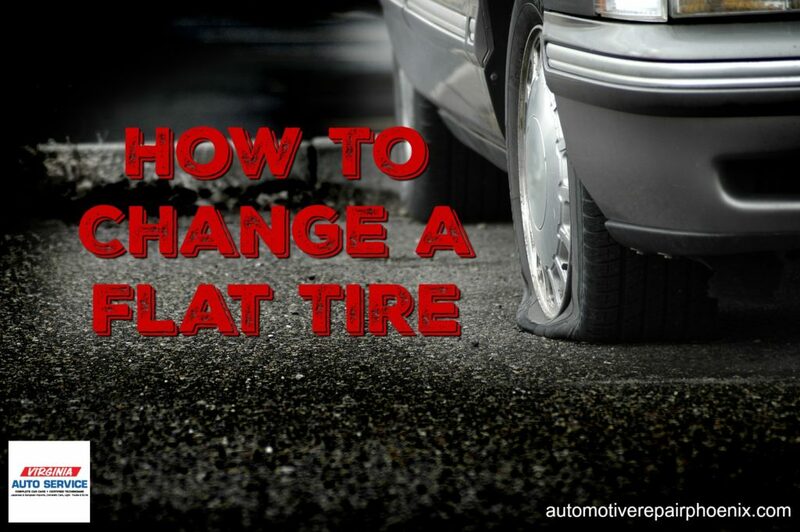 With a little know-how, changing a flat tire is not overly complicated. Review your owner’s manual to learn steps that may be specific to your vehicle. Also, consider practicing changing your tire at home in your driveway a few times, just to make sure you can handle it when you need to. In total, changing your tire shouldn’t take any more than 15-30 minutes. Reduce your speed. If you are driving when you develop a flat tire, the first thing you need to do is start slowing down. Do not slam on the brakes, instead, slowly reduce your speed by gradually removing your foot from the brake. Turn on your hazard lights. Your hazard lights, or emergency flashers, should be turned on the moment you begin slowing your speed to pull over. This helps to alert other drivers that you are likely trying to make your way off the road to pull over, allowing them to maneuver accordingly. Pull over to a safe location. Look around you for an expanse of road that is straight and level and has a broad shoulder. If you can make it to one, a parking lot or something similar would be the ideal place to change a tire. You want the ground to be level to help prevent your car from rolling while you change it. Avoid pulling over where the road curves and choose a straight stretch so other motorists can see you more easily. Do not change your tire on a constricted shoulder where there is bound to be traffic. Stopping in too narrow a spot will increase your chances of being hit by another vehicle. Instead, move at a slow pace until you locate a spot with a wide shoulder for safety. Driving on a flat tire may increase your chance of damaging your rim, but that is preferable to endangering your life. Engage your parking (emergency) brake. Using your parking brake will help minimize the chances of your car rolling while you are changing your flat tire. Place the wheel wedges. Wheel wedges are to be used for your safety, again preventing the vehicle from rolling. You place the wedges either in the front of or behind your tires, depending on the location of the flat. If your flat tire is in the back of the vehicle, place the wedges in front of the tires at the front of the vehicle. If the flat is in the front of the vehicle, then place the wedges behind the back tires. If you don’t keep wheel wedges in your vehicle, large stones or bricks are a good substitute. Take off the hubcap. Most tires have a hubcap over the lug nuts, which is more easily removed before you lift the car with a jack. Removing the hubcap using the flat side of your lug wrench works on most vehicles, however, some require another tool. Refer to your owner’s manual to learn the correct way to remove your hubcap ahead of time so you are properly prepared when the time comes. Loosen (but don’t remove) the lug nuts. With your lug wrench, rotate the lug nuts to the left (think “lefty loosey, righty tighty”) until you notice a break in resistance- about a quarter to one half of a turn. It may be necessary to use a lot of muscle, which is just fine. Put all your weight behind it if you need to. Do not fully remove the lug nuts at this time. Place and use your jack. Position the jack under your car’s frame next to the tire that is flat. Refer to your owner’s manual for the correct placement of the jack on your vehicle. Place the two-inch by six-inch piece of wood beneath your jack before you lift your vehicle. This will help to keep it from settling and becoming unbalanced. Doing this is exceptionally helpful on the asphalt. Once the jack is properly and safely positioned begin raising your car until the flat tire is around six inches off the ground. For your safety, do not go under the vehicle while the vehicle is raised. Remove the lug nuts. It is at this point that you should finish removing the lug nuts. Because they have already been loosened, they will likely come loose easily by hand. Remove the tire. Grab the flat by its tread and gently pull it until it comes off the hub. Set it down on its side to avoid having it roll away. Place your spare tire on the hub. After the flat has been removed you can put the spare tire in place. To do this, line up the rim with the lug bolts. Gently push the tire until the lug bolts are showing through the rim. Begin tightening the lug nuts. After the tire is placed you can begin to tighten them by hand. Tighten them as far as you can get them manually. Begin to lower your vehicle and finish tightening the lug nuts. Using your jack, lower your car down to where the spare rests on the ground without the weight of your car resting on the tire. Then, tighten the lug nuts the rest of the way using the lug wrench. Use your whole body and tighten them as much as you can. Finish lowering the vehicle. After the lug nuts are nice and tight, lower the vehicle the rest of the way to the ground and then remove the jack. Then, use the lug wrench on the lug nuts one more time, ensuring that they are as tight as you can get them. Place the hubcap. If you had a hubcap to remove, now is the time to replace it, if it fits with your spare. Pack away your tools. If your hubcap doesn’t fit on your spare place it, the wheel wedges, your jack, wrench, and flat in the trunk or other storage space of your vehicle. Check the spare tire pressure. You want to make sure your spare is safe to drive on by checking its pressure. Mini or temporary spares usually need 60 psi. If your spare needs air, slowly drive to a gas station to fill it right away. Fix or replace your flat tire. Don’t delay in replacing your flat tire. The temporary mini-spares aren’t made to drive at high speeds and shouldn’t be driven on for long. Cautiously drive your vehicle to a professional tire technician as soon as possible. They can determine if the tire is salvageable or if it needs to be replaced. Having the knowledge you need to change a tire is important, however, regular maintenance can go a long way in preventing a flat in the first place. Remember to always keep your tires inflated properly, watch for tread wear, and rotate your tires per the guidelines set in your vehicle owner’s manual. You may not be able to completely prevent a flat, but these things will certainly help to extend your tire’s life. 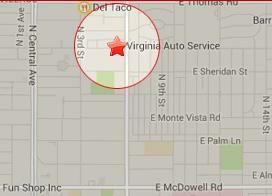 If you have any automotive concerns, please don’t hesitate to call on the experts here at Virginia Auto Service. Call 602.266.0200 or schedule an appointment online. 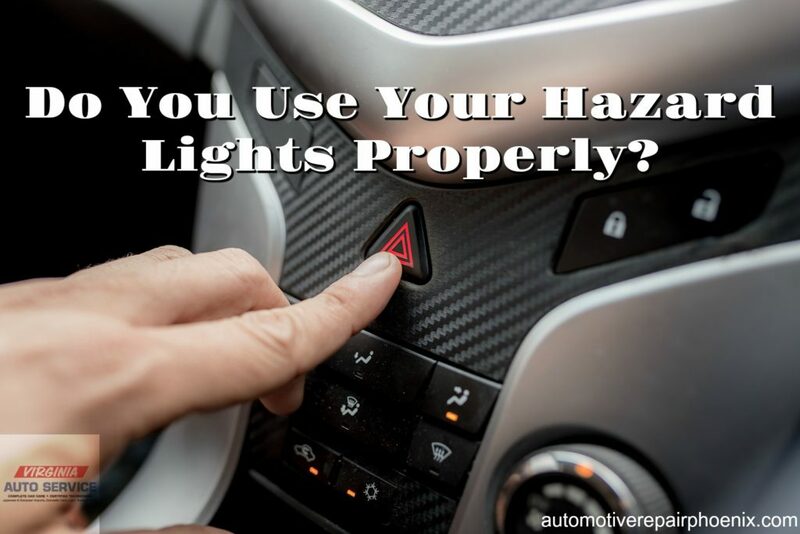 Do You Use Your Hazard Lights Properly? The lights on your vehicle are one of the only forms of communication you have with other drivers on the road. The turn signal lets other motorists know what your next move may be. Are you turning right or left? Do you need to change lanes? The brake lights let other motorists know that you are slowing or stopping and they can plan accordingly. The hazard lights are there to let others know when there is a problem, and there is a right and a wrong way to use them. Here are some Do’s and Don’ts of hazard light usage to help you stay both legal and safe when you are on the road. You are driving in inclement weather. When there is precipitation blurring road visibility and you turn on your hazard lights, other motorists may have a hard time determining which lane you are in or if you are changing lanes. Your headlights and taillights will suffice in bad weather. If you are worried, you should pull off the road and stop until weather conditions have improved. Remember, if you are in a dust storm to pull off to the side of the road and park your car, removing your foot from the brake and turning off all lights to avoid being hit by another vehicle. You are in heavy traffic. It is true that hazard lights make you more visible, but heavy traffic alone is not an excuse to use them. In some vehicle’s, when your hazard lights are engaged, your turn signals are disabled, which would make it difficult for other motorists to anticipate what it is you are doing. You are parked illegally. Contrary to popular belief, if you turn on the hazard lights on while parked illegally, it doesn’t make it legal. You need to find an appropriate place to park and avoid blocking traffic. You can use a turn signal instead. If you have slowed to exit the road due to a car problem, don’t immediately reach for the hazards. As was stated above, turn signals are often disabled when the hazards are on and other motorists may find it difficult to know what you are doing- which could result in a crash. Wait until you are safe on the shoulder and out of traffic to engage the hazards. You are being pulled over. When law enforcement has signaled for you to pull over, you can turn on your hazard lights to let them know that you got their signal and are following their request. Slow your speed, engage your hazard lights and pull over in a safe location. You are changing a tire on the roadside. You should use your hazard lights when your vehicle has become a potential hazard for other motorists. If you are on the side of the road changing a tire, your hazards allow for you to be seen and help keep everyone safe. You are broken down waiting for a tow. If this is the case your vehicle is a temporary hazard. Use your hazards to warn other motorists of your presence, especially if you cannot get your vehicle out of the line of traffic. You are part of a funeral procession. Vehicles involved in funeral processions customarily drive with the hazard lights on, even when otherwise prohibited. Funeral processions are the one exception to most hazard light rules. It is also important that you are aware of any hazard light laws that your state may have. Here in Arizona, hazard light use is not permitted while driving except in an emergency. For a list of other hazard light laws by state, click here. At Virginia Auto Service, we like to help people with their vehicles and road safety in any way that we can. We hope that you find these tips for proper hazard light use helpful. Remember, if your vehicle needs service, we are your go-to in Phoenix, AZ for reliable, high-quality auto repair services. Call (602) 266-0200 or schedule an appointment online. As drivers living in the desert climate of Phoenix, Arizona, one of our biggest fears is being locked out of our vehicles. Especially if we left something, or maybe even someone important inside. 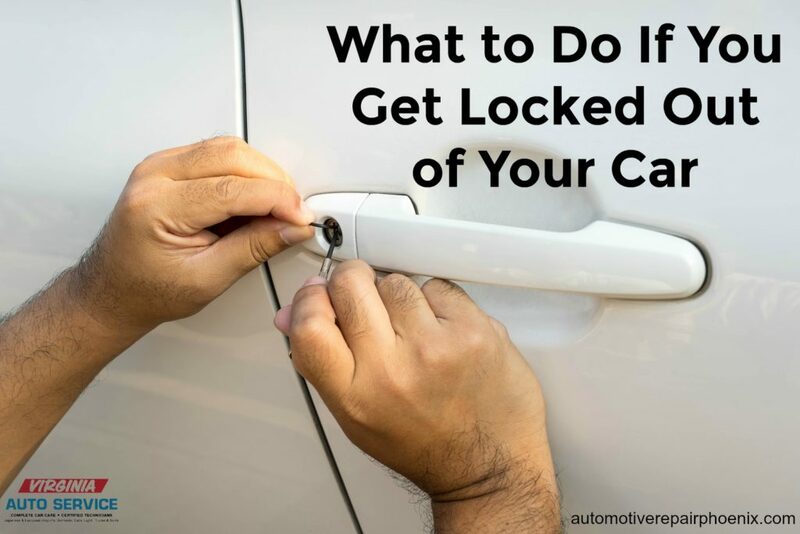 If you are worried about the possibility of becoming locked out of your vehicle or find yourself in that exact situation, there are things you can do to resolve the situation quickly and safely. Some people will hide an extra house key under a fake rock or in a flowerpot for the times they find themselves locked out of their house. You can do the same with a spare car key. It may be a little more challenging, but it can be done. There are magnetic key cases that you can attach to the underside of your vehicle. Just remember that there is a possibility of the key holder falling off when you hit a bump, so make sure the key holder you get has a strong magnet. This is one instance when you really don’t want to buy the cheaper model. You may want to even consider one with a powerful rare earth magnet and combination lock. Make sure you attach it to a flat, clean surface and that it opens up and not down (to avoid the chance of it falling open and losing the key). Avoid obvious places to hide a key, like under the wheel well or the bumper- get creative. You could also tape a key to the vehicle behind the license plate. Some people like to carry a spare key in their wallet or pocketbook, which is a good option, as long as you don’t leave it in the car too. OnStar offers remote door unlocking services. If you subscribe to OnStar, all you need to do is call their customer service number and give the OnStar Advisor your account number and PIN. Then they will send a signal to your vehicle that unlocks the door. Visit their website for more detailed information. All of the plans provided by AAA come with Roadside Assistance- which helps with lockouts. There are three AAA memberships available ranging from $56-120 a year. There are other maintenance benefits as well as towing services and discounts at hotels available. Keep a spare with someone you trust who you can call if needed to help you get into your car. If you have given anyone a spare key to your vehicle, call them and see if they are available to bring it to you. If a child or pet is locked in the vehicle, or you are locked out of your car in an unsafe place or situation, you can call the police and ask for help. Police have the proper tools to help you enter your vehicle. However, if there is no immediate risk involved, the police would rather you call up a locksmith or tow truck so that they can focus their attention on more urgent tasks. It can cost a bit to call a locksmith or tow truck, usually around $100, but you will at least be able to get into your vehicle. If a child or pet is locked in the car, some locksmiths have been known to do it for free. At Virginia Auto Service, we like to help people with their vehicles and road safety in any way that we can. The best way to prevent a lockout is by preparing for it in advance with one or more of the recommendations we have given you above. We are your go-to in Phoenix, AZ for reliable, high-quality auto repair services. Call (602) 266-0200 or schedule an appointment online. Note: If there is a child locked in the vehicle, especially in the Arizona heat, call the police immediately. You need to remember to stay calm for your child. If they begin screaming in reaction to you, they can heat up more quickly. Do what you can to keep them calm until help arrives. If it is summer and extremely hot, you are far from help, you don’t have access to a phone, or the child is in distress, you may have to break a window. A small price to pay for the child’s life. If you need to break in, wrap your arm in a shirt or towel to keep the glass from cutting you, then find a large rock or something that will break the window. Do it as far from the child as possible to avoid cutting them. 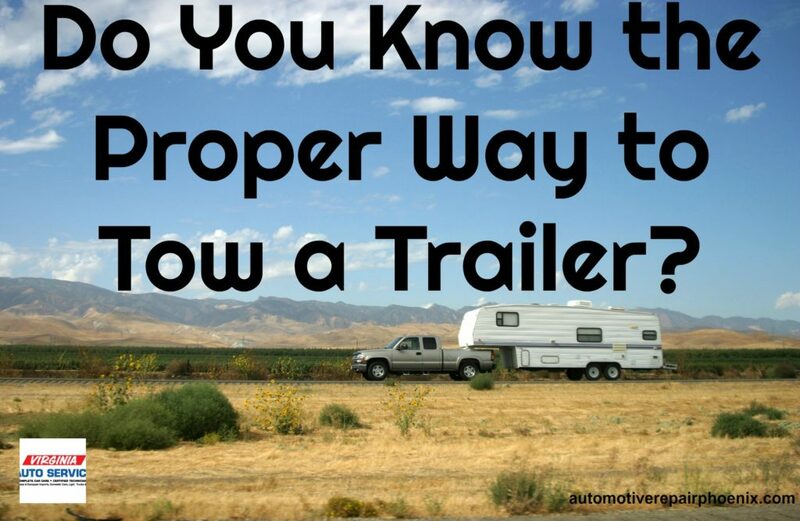 Do You Know the Proper Way to Tow a Trailer? One of our favorite things about living in Arizona is the fact that no matter the time of year, there is always somewhere you can camp! In the spring and summer months, Valley residents can head up North to the Mogollon Rim, Flagstaff, Show Low, or the Grand Canyon- to name just a few places. In the fall and winter, the Superstition Mountain desert area and places like Kartchner Caverns near Tucson make great camping destinations. When traveling to the numerous camping destinations, you may be towing a travel trailer, camper, or even a fishing boat if you will be near one of the lakes. If you are going to be towing a trailer anytime soon, you may want to make sure you are up to snuff on your towing know-how. When you tow improperly, you run the risk of damaging your alignment, brakes, suspension, tires, and transmission. For this reason, we have put together the following towing tips. Before you hitch up and hit the road, you should consult your vehicle owner’s manual to learn your towing capacity. The towing capacity is the maximum weight your vehicle can pull without causing damage or impacting safe handling capabilities. Have you ever strained your back when lifting an object that is just a bit too heavy? Something similar happens to your vehicle when you overload it. When your vehicle is pulling too much weight or something that it isn’t meant to tow, the axles, brakes, engine, transmission, and/or wheel bearings could be damaged. When towing, you will usually depend on four major pieces of equipment: the hitch, hitch receiver, a hitch ball, and a drawbar. These components work together to keep your trailer safely connected to your vehicle. You need to make sure that your gear matches the size and weight of the load you are carrying. Hitch- This is the piece that is attached directly to the vehicle. It is the connection between your vehicle and the trailer. There are over 10 different types of hitches. The type of hitch you will need to use depends on the type of vehicle you drive and its towing capacity. This information can be found in the owner’s manual. Hitch receiver- This is the base for all the components and is rated for different sized loads. Drawbar- This is a small tube that strings through the hitch receiver and attaches to the hitch ball. They come in different heights so that the trailer will follow at a level plane. Instead of dealing with the hassle of finding the right drawbar for each hitch, you can purchase one that is adjustable. Hitch ball- These come in different sizes and can carry growing amounts of weight. Remember, all towing gear is not created equally. The equipment you used to tow a moving trailer may not be the right size for towing your camper or boat. Refer to the manufacturer of the gear’s guide and your vehicles owner’s manual to help you choose and assemble the proper equipment. Once the trailer is connected to your vehicle with the appropriate equipment, perform these final safety measures before you hit the road. Use chains under the hitch for extra support. When you double-cross a set of chains under the trailer hitch side to side forming an “x” it provides more support and can prevent your trailer from bouncing into a guardrail or swerving into another vehicle should something come loose in the hitch. Don’t forget the lights. When you tow a trailer your taillights and brake lights won’t be visible to other drivers. For this reason, trailers come with trailer signal wiring. When you connect the wires from the trailer to your vehicle they will mimic your regular taillights. Test the lights before you head out on your journey to make sure they are set up properly. Turn signals and brake lights that function properly are vital to your safety and the safety of other motorists. Make sure the item(s) you are towing are secure. Remember, especially if you are towing an open trailer, that you will be traveling at fast speeds and things will move around and possibly fly out if not properly secured. Fasten a tarp over your load to help prevent flyaways, and to protect your stuff from the elements. Also, use bungee cords to tightly secure items that may bang around and brake inside of the trailer. Pay close attention to your driving. When you drive with a trailer it isn’t the same as your everyday driving. When towing a trailer, you will need to accelerate, brake, turn, change lanes, and turn corners at about half the speed you usually do. Also, be prepared to stop for gas more frequently as the extra weight you are towing will decrease your fuel economy. Know the laws. Make sure that you know the laws of towing a trailer wherever you may be traveling. At a minimum, most states require you to have working taillights and brake lights. Others, including Arizona, will require your trailer to be registered with the Department of Motor Vehicles. Care for ALL your tires. Make sure you are not only maintaining the tires of your vehicle, but those of the trailer, and your spare(s). A blowout is always potentially dangerous, but even more so when you are towing. All tires should be inflated to their recommended psi and closely monitored throughout your trip. When your tires are over or underinflated, it reduces the effectiveness of your brakes, and the trailer could sway. Make sure your vehicle can handle the trip. Before you head out on your adventure, make sure your vehicle is up to the task of towing your boat, camper, or trailer. Worn tires, transmission problems, improper wheel alignment and existing brake problems can be dangerous on the road. The added weight of the item being towed will make it even more so. Make sure your vehicle is road trip safe before you leave. At Virginia Auto Service, we like to help people with their vehicles and road safety in any way that we can. We hope these tips help you stay safe the next time you tow a trailer. If you need help making sure your vehicle is up to the task, we are your go-to in Phoenix, AZ for reliable, high-quality auto repair services. Call (602) 266-0200 or schedule an appointment online. Now that school is back in session for most children in the Phoenix metropolitan area, motorists will need to start paying close attention to the roadways for school zones. School zones are meant to keep children safe as they arrive at and leave school. However, there are times when these zones are a risk for both pedestrians and motorists. Every school year, over 55 million children across the United States head back to school. According to AAA, around 13 percent of those children are usually walking or biking to their classes. Others may pass through the school zone after exiting a bus or caregiver’s vehicle. The chaos of the busy school zone may be dangerous to children. Nancy Pullen-Seufert, associate director of the National Center for Safe Routes to School, says, “There’s a lot of activity that happens between arrival time and dismissal time that can be distracting, and that’s the piece that can make it risky for young pedestrians.” It would also seem that motorists, even those who are dropping off their most precious cargo, need a refresher course on the rules of school zone driving. A study found that two-thirds of drivers exceed the posted speed limit during the 30-minute period before and after school. Automated photo enforcement measures discovered that 78 percent of drivers sped in school zones, and 82 percent of drivers passed a school bus illegally. A report by Safe Kids Worldwide shows that motorists often violate stop sign rules at intersections in school zones and residential neighborhoods, with 45 percent failing to come to a complete stop, 37 percent rolling through the stop sign, and seven percent failing to slow down. According to AAA, the most dangerous time for the school zone and beyond is after school from 3-4 p.m. It is during this window that more school-aged pedestrians are killed by motorists than any other time of day. According to the most recent year for which data is available from the National Highway Traffic Safety Administration (NHTSA), the number of traffic fatalities among pedestrians age 14 and younger went down from 391 fatalities in 2002 to 230 in 2011. The downward trend is good news, however, in 2011, an estimated 11,000 pedestrians age 14 and younger were injured in traffic accidents overall. Speed cameras, crosswalks, stop signs, flashing lights, and crossing guards can only offer so much protection for school children. Motorists need to be aware of their surroundings and follow the driving laws in the school zone. Always expect the unexpected, especially around young children. James Solomon of the National Safety Council says, “Children run and play. They can come from anywhere.” Remain alert. Observe the speed limit. State law, specifically Arizona Revised Statutes (ARS) 28-797, provides a uniform application of 15 mph school zone traffic control for elementary and middle schools (kindergarten through eighth grades) at authorized school crossings meeting certain minimum criteria. The limit near most high schools is posted no higher than 25 mph. Nancy Pullen-Seufert of the National Center for Safe Routes to School says, “The faster you are going, the more likely you are to injure a pedestrian and to injure them more seriously.” According to the NHTSA, five percent of pedestrians hit by a vehicle at 20 mph suffer a fatality. The fatality number increases to 45 percent when hit by a vehicle going 30 mph, and to 80 percent for a pedestrian hit by a vehicle traveling at 40 mph. The NHTSA goes on to state that driving faster also means longer stopping distances. For example, when you are traveling 20 mph it takes you around 69 feet to come to a complete stop. At 30 mph, it takes you 123 feet to stop, nearly double the distance. Stay off electronic devices. Distractions, like talking on your cell phone, have been proven to reduce a driver’s reaction time. Looking away from the road for only two seconds can double your chances of crashing. Texting while driving has been proven to be as dangerous as driving drunk. Kate Carr of Safe Kids Worldwide says, “The ability to multi-task is a myth. If you are going to drive your child to school, drive your child to school. Leave the cell phone in a place where you aren’t going to be distracted.” Remain vigilant and able to navigate the school zone completely prepared to handle any situation that may arise. Make eye contact with pedestrians. When you see a pedestrian that looks like they may want to cross the road, make eye contact with them so that you know you have been seen. “If you haven’t made eye contact with them, assume that they haven’t seen you and that they are just going to keep on going,” says Carr. Don’t pass school buses. In all 50 states, it is illegal to pass a school bus on undivided roadways when it is stopped to load or unload children. The National Safety Council states that most children who die in a bus-related accident are pedestrians between the ages of four and seven who are either hit by the bus or motorists passing the school bus illegally. Laws will vary from state to state regarding passing a school bus on a divided roadway when the bus is traveling in the opposite direction. No matter what, all vehicles behind the bus must stop. Today, many school buses are equipped with rear cameras to catch motorists who illegally pass them. Watch for bus warning lights. When there are yellow flashing lights on the bus that means that the bus is preparing to stop and let children on or off, and you need to give it room to do so. When the light is red it means that children are currently loading or unloading. At no time when the lights are red or yellow should you attempt to pass the bus. Give the buses plenty of space for loading and unloading. Kids are at most risk of being hit by a car with in the 10 feet around the bus. Take an alternate route. 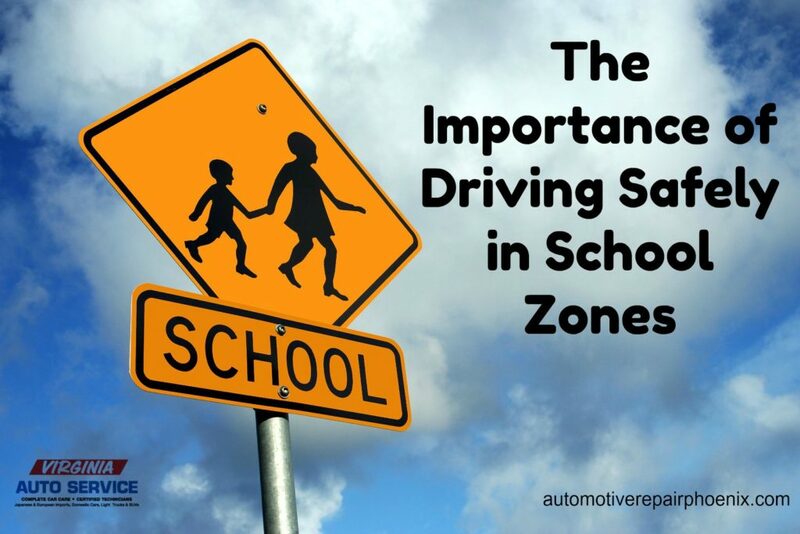 If you are not a parent responsible for picking up or dropping off a child, it may be best to avoid driving in a school zone altogether to avoid any frustrations. Treat each child as if they were your own. It’s not only impatient motorists who are running late for work that are responsible for school zone accidents. Parents are just as likely to break school zone rules when they are picking up or dropping off their children. Keep in mind that even though your child has been picked up or dropped off safely, there are others still out with the possibility of being injured. Stay vigilant and follow the school zone rules and keep these children safe. You know you would want other parents to do the same for your children. The monsoons may have been late to start this year, but once they did they sure did not disappoint. Only a few days ago Phoenix was hit by a massive storm which resulted in storm damage and flooding over much of the area. According to AZCentral.com, the storms caused heavy street flooding, power outages and extensive flight delays at Sky Harbor International Airport. The Phoenix Zoo was even forced to close for a day following the intense storm in order to clean up the multiple trees that were downed, along with two tents that were destroyed. Thankfully no animals were injured in the storm. These crazy weather conditions can bring on a road hazard that is dangerous for motorists- slick, water-filled roads that could result in hydroplaning. Hydroplaning is the term that is often used to refer to the sliding or skidding of the tires of the vehicle over a wet surface. It occurs when the tire encounters more water than it can scatter. There is water pressure in the front of the wheel that pushes water under the wheel separating it from the surface of the road. Essentially, your vehicle begins to ride on top of standing water instead of the surface of the road resulting in a loss of traction. Losing traction results in a loss of braking, steering, and power control. Contrary to popular belief, it is possible for a vehicle to hydroplane when the road is only slightly damp. Even just a light rain can mix with the oil residue on the surface of the road creating slick conditions that can make vehicles, especially those going 35 mph or more, to hydroplane. A scary, and potentially deadly, event for the driver and motorists in the surrounding area. Slow down. Like we said above, hydroplaning is more likely to occur at speeds of 35 mph or higher. The moment rain hits your windshield, slow your speed at least five to ten miles below the speed limit. In heavier rain and/or windy conditions you may want to lower your speed even more. Avoid sudden accelerations -such as passing other motorists- as sudden increases in speed increase the risk of hydroplaning. Keep your tires properly maintained. Tires have tread (grooves) that are designed to channel water from beneath the tire, creating greater friction with the road surface minimizing or even preventing instances of hydroplaning. When the tread is worn down you do not get as much traction and it can be very dangerous to drive on slick or bald tires. You should replace tires when needed and perform regular tire rotations. Also, keeping the tires properly inflated increases traction and can help prevent hydroplaning. Avoid driving in outer lanes where water collects. You’ve seen it, driving around during or after a storm there are some outer lanes where water seems to accrue, which can be dangerous. When possible, avoid driving in these lanes. If you can see the standing water, then it is very likely that your vehicle will hydroplane as it drives over it. Drive in the tracks left by the cars ahead of you. The cars ahead of you have started separating the water for you, increasing your traction and connectivity to the pavement. Turn off cruise control. You should never use cruise control while it is raining or when you are driving on wet roads. Should you begin to hydroplane with your vehicle in cruise control it will take longer for you to disable the function and start to regain control of your car. Avoid driving aggressively. Aggressive driving is never safe, however, in bad weather and on wet roads it becomes even more dangerous. Do not make any quick or sharp turns, avoid hard braking, and like we said above, do not speed or pass other motorists. 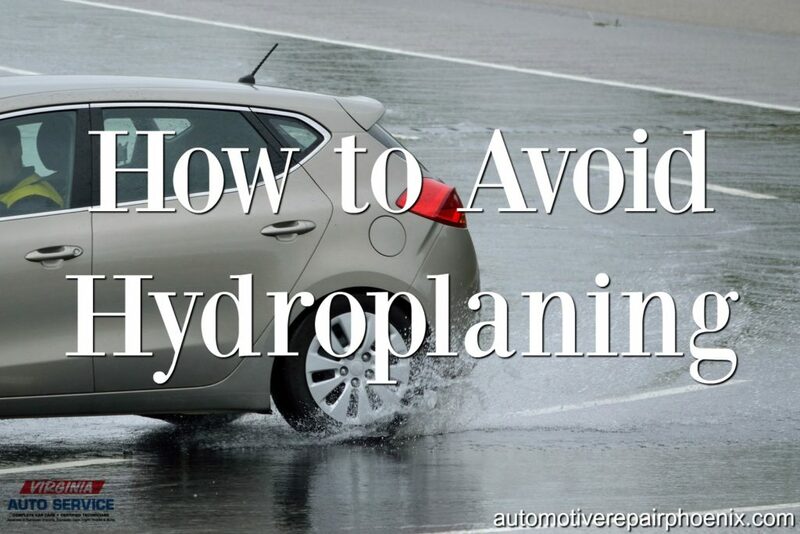 Unfortunately, there are times that hydroplaning will occur no matter how careful you are. These are the steps you can take to regain control if you should begin hydroplaning on a wet surface. Remove your foot from the accelerator immediately. You should never use your brakes in response to hydroplaning. Braking suddenly can result in your vehicle skidding completely out of control. Gently turn the steering wheel in the direction your vehicle is hydroplaning. It may seem contradictory, but doing so will realign your tires with the direction your vehicle is moving, helping you regain steering control. Wait for reconnection. It will be obvious to you when the vehicle is past the hydroplaning situation and has reconnected with the surface of the road. Pull over and breathe. Hydroplaning can be a scary event. Give yourself a minute to recover and collect yourself before continuing your journey.